Have you ever facing a problem that your own custom parts or parts saved out of Toolbox folder are still replaced with the standard Toolbox parts What is the problem? What could be the reason? The answer is the New Option in SolidWorks 2011. 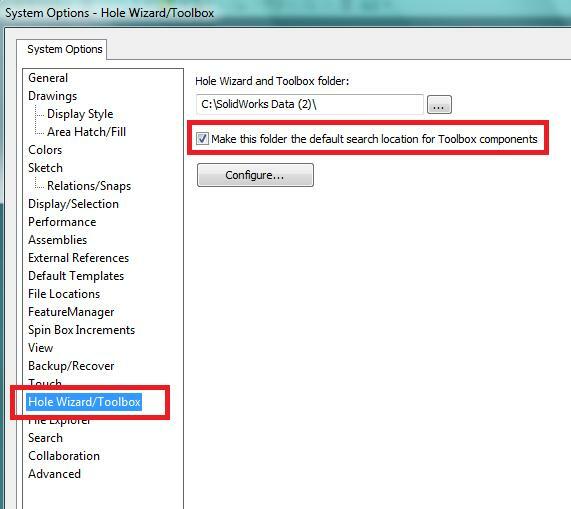 When this option is checked, if you open any assembly that contains some custom parts or some Toolbox copied parts (even though the parts are located in the same folder of assembly), SolidWorks will look for the files only in the Toolbox location that has been defined under the HoleWizard/Toolbox path. The parts will be replaced with native Toolbox parts from the Toolbox folder. Prior to introducing this option, Toolbox files would be inserted from the Toolbox file location when added to an assembly, but did not always open from the same location later. This caused confusion in some environments. The new option ensures that files always open from the specified Toolbox location. If you frequently use copied Toolbox parts that exist outside of the Toolbox folders, then this option may be interfering with your setup. Uncheck the option to restore the SolidWorks 2010 behavior.